The Bowers & Wilkins P5 Wireless headphones are one of the better-built headphones we've ever tested. But when it comes to sound quality and their active noise cancelling it just isn't up to par with some of the other headphones in the $400 price range. If you get these headphones you're basically paying for the great build materials and design. If you’re looking for a set of high-end headphones, Bowers and Wilkins is a good place to start. With options bedecked in expensive leather, or just all-around great build quality, the British company has held a sterling reputation for years. This is why you’ve probably noticed the explosion of reviews after the release of the Bowers & Wilkins PX active noise canceling headphones; when this company launches a new product, audiophiles take notice. So do they live up to the hype? Yes and no. 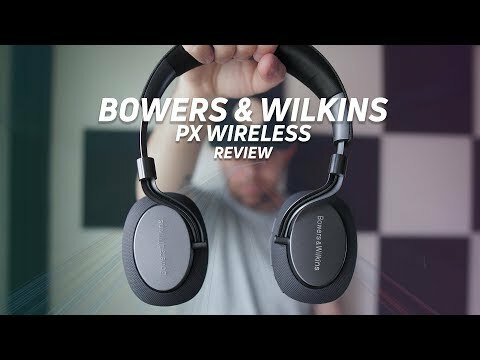 Who is the Bowers and Wilkins PX good for? Bowers & Wilkins PX Wireless have rotating ear cups. Bowers & Wilkins is known for its attention to detail, and the PX continues that tradition. Though the PX uses considerably less chrome finish and leather than its other offerings, the matte finish and coarse cloth accents are much less “classic car” than they are 21-st century chic—but it’s a welcome refresh to the classic aesthetic. The build changes aren’t just skin-deep either. Bowers & Wilkins also marked a departure from its traditional ear pad design, for better or worse. There’s far less padding on the PX than the P7 wireless, but it definitely helps radiate heat better. However, those with larger heads will miss the extra padding, as the relative weight of the PX combined with the clamping force will make bigger noggins ache after long listening sessions. Smaller heads and shorter (think sub-2hr.) sessions will be A-OK, though. You’ll find all of the buttons and playback controls on the right ear cup. Inside the ear cups are angled drivers to meet the natural tilt of your ears, which I always appreciate. It helps dispel unintentional phase issues and helps make a more realistic representation of 3D-space in your recordings. Additionally, the supplemental drivers that make the Active Noise Canceling possible reside right in the dead-center of the speaker units, raised so they’re closer to your ear canal. This is a smart choice, as it reduces the overall power each driver needs to output in order to cancel outside noise as it reaches your head. All of the controls for the Bowers & Wilkins PX can be found on the right ear cup, on the back edge. Volume controls a multifunction button, a toggle for the “Environment filter” used by the app, and a power/connection slider all ring the right ear cup. On the bottom, a 3.5mm female jack along with a USB-C charging port sit rather unobtrusively next to the indicator LED. What kind of connections does the PX have? The headphones are wireless, but you can attach the included 3.5mm audio cable as well. You can use the included 3.5mm cable, but the Bowers & Wilkins PX are geared towards wireless listeners with aptX HD support. This is quite a step up from your standard Bluetooth codecs, and offers the latest profiles to handle headset functions with just about any smartphone out there. However, I will point out that like the Bose QC35 II, you’ll need to download the app and turn location services on in order to get the most from your headphones. Seems more than a little unnecessary given there are other headphones on the market that don’t require you to share your location with the manufacturer in order to unlock the best features of your cans, but that seems to be pretty standard nowadays. One feature that’s both useful and annoying is the auto-pause. These have a tiny sensor in them that pause whatever you’re listening to whenever you remove the headphones and then resume playback when you put them back on. In my experience, it was super sensitive to the point when music would pause just if the headphones moved a little. Luckily, you can tweak the sensitivity in the app if you’re having this problem but it never fully went away for me. Even when I went into the app to turn off that feature I found that music would still randomly pause when I didn’t want it to, though the frequency of instances definitely decreased when I did so. How long does the PX’s battery last? The Bowers & Wilkins PX Wireless headphones use gorgeous build materials with minimal branding. While battery life depends greatly on how loudly you listen, the PX can handle just about any trip you throw at it. Chris was able to travel from to London, then Edinburgh, back to London, and then died before his flight back. All told, that was probably about 12 hours of listening—but a cold snap definitely didn’t do the battery any favors (it was the dead of winter, after all). How does the PX sound? The PX struggles with bass underemphasis, and makes the mids and highs too loud in comparison. While these are one of the better-looking headphones we’ve tested in the $400 price range, they’re not the best sounding or the best at active noise canceling. The ANC isn’t as strong as something like the Sony WH-1000X M2 or the Bose QC35 II, but it gets the job done. The low hum of the heater all but disappeared in my apartment, but the same can’t be said for the rumble of voices in my local coffee shop. On the bright side you can adjust certain aspects of the ANC within the app itself so if you do want to hear more of what’s going on around you there’s a slider you can adjust until it suits your needs. As far as sound goes, these aren’t going to blow you away. Recently we wrote a piece about how to EQ your music and in it, we mentioned how you’ll find a lot of instruments in the range of 100Hz – 1kHz. We also mentioned how if you don’t take special care here you can end up making your music sound like “muddy”, which basically means that the instruments in that range are competing for space and the PX Wireless fall victim to that. While bass kicks in the song Glow by Retro Stefson were more or less fine, the bass guitar and even some of the vocals weren’t clearly defined. Throw in the guitar licks and synthy elements that pop in during the chorus at 2:47 and it’s hard to really pick out any one instrument. The highs didn’t fare any better, with the crashing cymbals and hi-hats in the song Dirty Paws by Of Monsters and Men really lacking in strength when compared to everything going on in the mid. The male vocals that underlie every line of the song are all pretty much lost in the mix. Don’t get me wrong, this isn’t to say that these headphones sound like garbage. I still had a pleasant few days of singing along to a few choice songs, but when you compare them to some of the other options in their price range it becomes painfully clear that what you’re paying for are the quality build materials and modern design. Not sound quality. The PX Wireless fit well on the head, but can get tiresome after a few hours. The ear cups leave plenty of space for the sound to bounce around. Should you buy the Bowers & Wilkins PX? Whether or not the PX should be on your radar really depends on what you’re looking for in a set of headphones. While they’re definitely a favorite of many who use them, Bowers & Wilkins are victims of circumstance in that their latest headphones look better than they sound. There’s nothing wrong with that, and there’s a lot to like about the PX. But if you have a Google Pixel or other Android 8+ phone… there are other options that might fit your needs better. Introducing PX: headphones just got a lot more personal. PX isn't just a new headphone. We've created not just the best-sounding noise-cancelling headphones you've ever heard, but headphones that are so intelligently designed, and so responsive, you might forget you're wearing them at all. With PX, everything just works in seamless harmony with your environment and the way you naturally listen to music. Combine intuitive controls with a beautiful ergonomic design and best-in-class acoustic performance, and you have something unique: a set of wireless headphones that will transform how you experience and enjoy music.